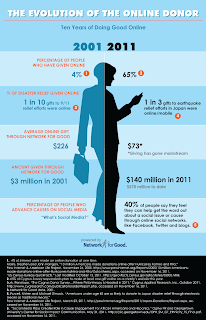 Only 4 percent of donors had given online in 2001. 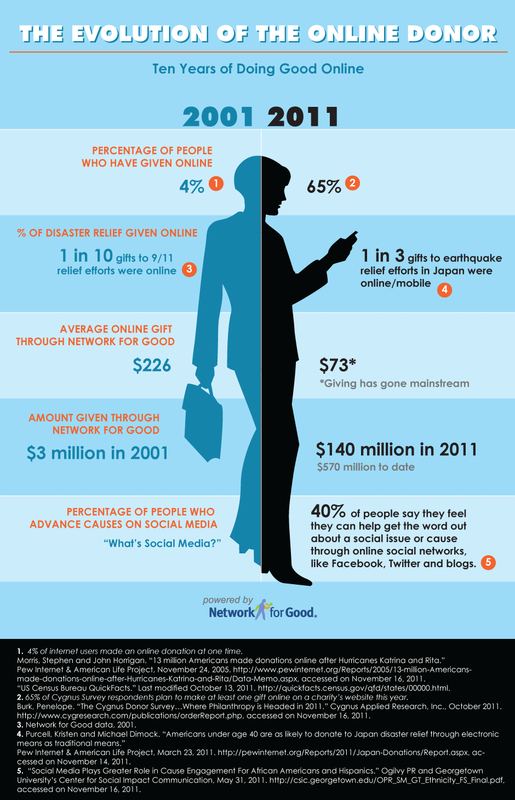 This year, about 65 percent have given to charity through the Internet. That’s one of the comparisons made in a new graphic from Network for Good, a fund-raising and volunteerism Web site that celebrates its 10th anniversary this month. ALBANY, N.Y. (AP) — New York Comptroller Thomas DiNapoli says late contract approvals and payments by the state are hurting nonprofit providers and jeopardizing services. DiNapoli says state agencies last year were on average six months late in approving nine out of 10 contracts valued at $50,000 or more, often after services were provided. An analysis of the first half of 2011 shows nearly 90 percent of contracts approved by the comptroller were submitted late by state agencies. DiNapoli says nonprofits operate on thin margins and provide basic services ranging from health care clinics to work programs, with 22,000 active grant contracts totaling $16.8 billion. The nonprofit sector employed 1.25 million people statewide last year. You can access the article by Clicking Here. The task force is charged with presenting a series of recommendations to reduce the regulatory burdens and costs for nonprofits while strengthening accountability. Thanks to Frank Lazarski for agreeing to take care of refreshments for this meeting. I look forward to seeing you!